Learn how to capture fireworks with your digital camera. There are several key factors to consider when answering the question: "How do you take pictures of fireworks with a digital camera?" However, none of them involve having the skills of a professional photographer. In fact, photographing a pyrotechnics show is easier than most people realize. Location is critical: Arrive as early as possible to the fireworks venue, so you can secure a prime shooting spot. In order to take breathtaking shots of pyrotechnics with a point-and-shoot digital camera or a DSLR, you need to determine where the fireworks will be launched. Then, try to find a clear, unobstructed view where you can set-up your photo gear. Perfect position: Don't set-up in the middle of crowd. By doing so, you risk having people walk into your shots. Avoid shooting near artificial light sources, such as streetlights, which can cause light flares. Pack wisely: Don't leave home without spare batteries for your digital camera. Also, bring a small flashlight so you aren't fumbling around in the dark trying to change your camera's settings. Finally, don't forget to bring along extra memory cards. You don't want to run out of memory during the grand finale of a fireworks show. How Do You Take Pictures of Fireworks with a Digital Camera? Once you are properly prepared to capture an aerial pyrotechnics display, you can concentrate on answering the question: "How do you take pictures of fireworks with a digital camera?" In order to take stellar shots of sparkling fireworks, you need a tripod. Fortunately, most tripods are inexpensive. Given how critical tripods are in capturing light trails, there's really no excuse not to get one in time for your fireworks shoot. Pyrotechnic displays require long exposure times and adequate camera support. A tripod will keep your camera steady and prevent blurry shots. You might also consider getting a remote control for your camera to avoid pressing the shutter button, which could lead to shaky shots. You want to minimize contact with your camera once you have it step-up on a tripod. If you are shooting with a point-and-shoot digital camera, remember the built-in flash will only have a reach of a few meters. What's more, by not disabling the flash, you are tricking your camera into thinking that it is shooting a subject that requires short exposure time. This is not the case with fireworks. Switch off your camera's flash; the fireworks will be bright enough on their own. Digital cameras feature varying exposure times. Some cameras may only allow a few seconds, while others may allow for 15 seconds or more. When shooting fireworks, you want to manipulate your camera's exposure to about three or four seconds. 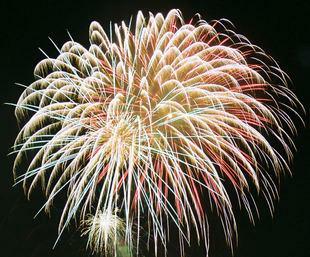 Fireworks mode: Many digital cameras feature a "fireworks mode" which provides longer exposure. Manual focus mode: Turn off the auto-focus mode on your digital camera when shooting fireworks. Auto focusing in low light can be very difficult for many digital cameras. In order to snap frame worthy fireworks photos, you will need to know where to aim your camera. After all, without proper framing your fireworks shots will likely go up in smoke. It's important to focus on your horizon. When framing fireworks, make sure your camera is even. This is especially important if you're adding background elements in your shots, such as buildings or a body of water. To add variety to your fireworks shots, consider switching up the framing. Experiment with vertical and horizontal framing. Both can work in fireworks photography, but you can often capture multiple bursts of light and sky steaks when shooting vertically. Horizontal framing works best if you're looking to capture fireworks with additional landscaping in the foreground or background.